Camryn Rhys has started a new series, Witches of Whitewood. Since I haven’t read her novels before, I don’t know how much there is crossing over to her Moonbound-series. This book was such an inspiration blog wise, as the main character Kyle is a chef (and a damn good one). Heart of Fire is definitely a romance novel. It has elements of magick and there are hints of werevolves too, but if that’s mainly what you are looking for, this book isn’t for you. But if you settle for romance and some damn steamy moments, I recommend this one. And the innuendo served its purpose, I’ll read the next installment in the series, because I just got to know what happens. If you’re interested, there’s update in the Jukebox regarding this novel. Of all the food cooked in the book, I chose apple crumble because it’s fall and apples are definitely in season right now. 1. Preheat the oven to 200’C. Take frying pan and add 50 g butter and melt it in medium heat. Once the butter is melted, add 50 g brown sugar and ground cardamom. Mix them and add the apple slices. Sauté the apple slices for 5-7 minutes. 2. Melt 50 g butter in microwave. Add 50 g brown sugar, cinnamon and oatmeal. Mix thoroughly. 3. 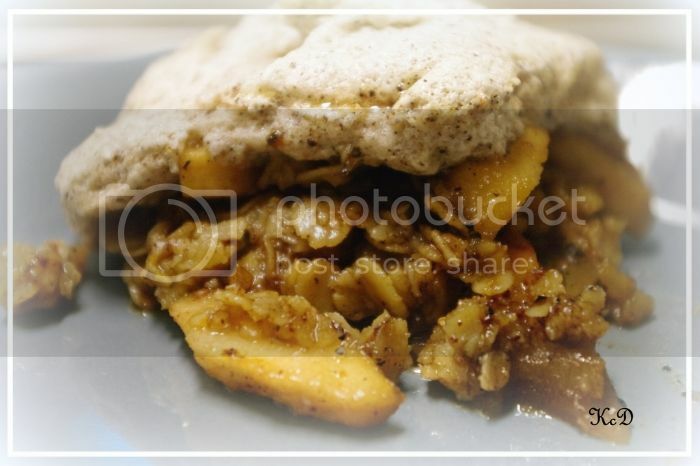 Take a oven pan and lay 2/3 of the apple slices on the bottom. 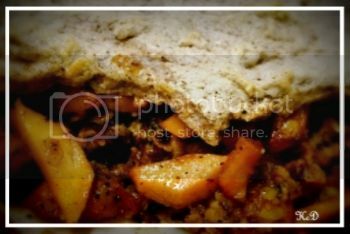 Then cover the apple with oatmeal crumble. Then top it with the rest of the apples. Bake in the oven for 25 minutes. 4. Take the pan from the oven and lower the heat to 150 ‘C. Let the apple crumble cool until the temperature in the oven has decreased. 5. Separate the eggwhites in a bowl and beat them with electric mixer. When peaks start to form, sieve in the icing sugar mixed with vanilla powder. Beat until you have meringue (turn the bowl upside down, if the meringue stays in the bowl, it is ready). 6. Top the apple crumble with meringue and bake it in the oven 10 more minutes. 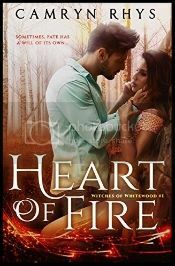 Heart of Fire is romance with a twist of magick. Kyle is a chef that need desperately this job as a trail cook. He’s newly divorced and just wants to get on with his life. That’s why he arrives to the Banfield ranch. Or that’s what he thinks… Mattie Banfield is the mother of sibling running the ranch. And it’s her doing that Kyle got the job. Just a little spell… Her magick is present throughout the book, but instead of making her children happy as she intended, it seems to do just the opposite. If you read this book as a stand-alone romance, it’s quite good. Heart of Fire is well written, entertaining story. But the story was too straight forward for my taste and that’s the reason for two stars. The hints of things happened in the past and the mentions of werewolves bugged me, ’cause they were left there hang in mid-air, leading to nowhere. But I still probably read the next installment, because I hate not knowing what will happen. Previous PostKate McCarthy: The End Game Anniversary Sale!